Brief: This article shows you how to type Roman Hindi in Ubuntu. Same steps will allow you to type in other Indian languages on Ubuntu Linux. The largest software development project on the Earth has accepted code contributions from almost 10,000 developers. Developers who come from a wide range of regions, ethnicity and languages. Diversity is in the blood… I mean the code of Linux. Talking about diversity, did you know that India has 22 major languages? Although almost all Linux distros provide support to Indian languages, typing is where the issue arises. It takes pretty long time to get oneself acquainted with the key bindings (Regional characters mapped to English alphabet keys). And to get comfortable and regularly use such a keyboard for day to day activities will take at least a month. To overcome the above-said frustration, transliteration keyboards were invented. Transliteration keyboards are something that let you type in English, transliterate them phonetically to the selected target language immediately. So to use a transliteration keyboard comfortably, you don’t need a month. Not weeks. A day’s too long. An Hour? Ok, let’s settle with 30 minutes for mastery. Yes, it’s that convenient. The Intelligent Input Bus (IBus) is an input method framework for multilingual input in Unix-like operating systems. It’s called “Bus” because it has a bus-like architecture. You can use IBus to type in your own language in most GUI applications. We will be using IBus to transliterate English to Indian regional languages. That’s it. Now add IBus to your startup applications. Open Startup Applications from the dash. Click on add. Give the name as “ibus” and in the command box type in the following and save. Log out and log in back. Go to settings >> Keyboard and click on text entry at the left bottom. Now use the ‘+’ below the “Input sources to use” to add your desired language. Search for ‘ibus’ and browse for your language in the search results and select it. If multiple entries are present under your language name, add all. DO NOT SEARCH FOR YOUR LANGUAGE DIRECTLY. Do not delete the pre-defined entry that is already present. Close all the settings windows. In addition to installing IBus, You need to install the desired language to the system. This can be done easily from the settings. Open settings and click on language support. Search for your language. Check it and click “Apply”. By default, English will be your typing language. Press Super+Space to select the next language that you added. If you added multiple languages, you may need to press Super+Space multiple times to check the transliteration language. You can see the language you have currently selected in the top panel on the right-hand side. Getting used to IBus will take you a maximum of 30 minutes. That’s it. You’re ready to go. I found IBus really very helpful in having a computing experience that was closer to my heart. 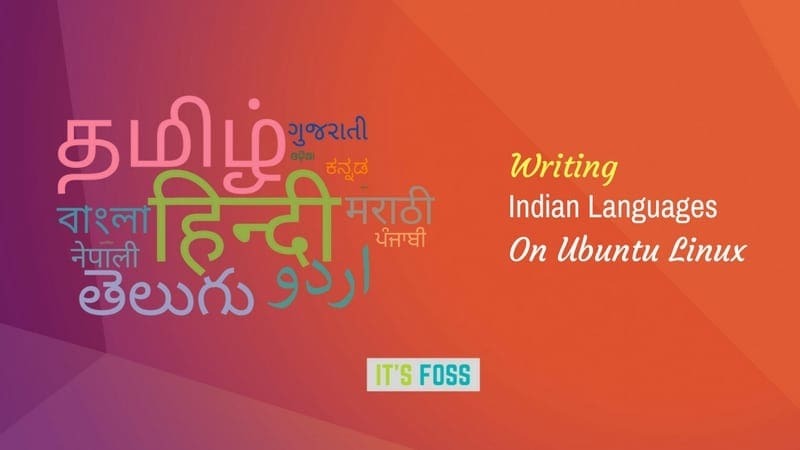 If you are able to type in Indian languages on Ubuntu now, do share this article. Also, use the comment section below and let us know about your thoughts on using non-English languages on Linux. Only sudo apt install ibus-m17n got installed. Is there an updated version of this article? It works the same in Ubuntu 18.04 as well.